A second body found at a house in Kent is that of missing teenager Dinah McNicol, police believe. The 18-year-old's remains were found in the garden at the Margate house on Friday and her family informed. Ms McNicol failed to return home to Tillingham in Essex from a trip to Hampshire in 1991. Peter Tobin, 61, has been charged in Scotland with the murder of Vicky Hamilton, 15, from Stirlingshire, whose body was found at the house on Monday. 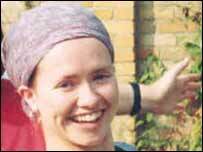 Vicky, from Redding, near Falkirk, was last seen in Bathgate, West Lothian, in 1991. Police have been searching the house and garden in Margate all week. Vicky's body was found in the sandpit in the back garden in Irvine Drive. Assistant Chief Constable Peter Lowton, of Essex Police, said Ms McNicol's body was found close to the patio. He said the height of the body, clothing, and jewellery, was consistent with it being that of the missing teenager. "Dinah's father Ian has been informed, although formal identification has yet to take place," he added. Officers will continue searching the property for further evidence, he said. Mr Lowton would not be drawn on whether there could be any more bodies at the address. "In respect of the scene itself, we retain an open mind and we will continue as we have done throughout and that is to focus on the investigation into the murder of Dinah McNicol, and time will tell. "But we'll keep an open mind and our focus at the moment is on securing evidence into Dinah McNicol's murder," he added. He said officers were waiting for "urgent analysis" of the remains. Dinah's father, Mr McNicol, 68, of Tillingham, said he was "elated" and could now "die in peace" knowing his daughter's body had probably been found. The teenager's body was removed from the site on a stretcher by undertakers on Friday afternoon, and a post-mortem examination was carried out later. The fifth day of the search at the Irvine Drive property had involved lifting the patio and excavating the ground underneath. Officers said areas of concrete floor inside the house were also being drilled and any abnormalities or other areas shown up by radar were being examined. Three archaeologists were on site in Irvine Drive on Friday. 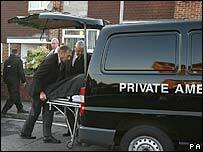 Detectives have carried out house-to-house inquiries in Irvine Drive and have appealed for any residents who lived in the area at the same time as Peter Tobin to get in touch with them. The family who lived in the house until Monday have been receiving support from Kent Police family liaison officers. Police are believed to be re-examining a number of other murder cases in the light of the discoveries at the house. These are believed to include the murder of Jessie Earl, who disappeared from Eastbourne in East Sussex in 1980 and was found dead nine years later, and the deaths of three women killed in Glasgow in the late 1960s by a man dubbed "Bible John".